Dr Dina Rezk’s research looks at contemporary history of the Middle East, including the Arab Spring, and has fed into policy briefings to the UK and US governments. She was recently selected as one of the AHRC and BBC’s New Generation Thinkers. Here she tells us how the Arab world has used Western cultural stereotypes of them to serve their own agendas, the part that social media played in the uprising – and her excitement of getting the chance to share her research with wider audiences. Dina, could you tell us a bit about your background and your research? I’m an Associate Professor of Modern Middle Eastern History and politics here at the University of Reading and I effectively look at how culture plays into conflict. My first project, which was forged in a post 9/11 era, looked at how western intelligence agencies, and in particular how Anglo Americans, analysed the Arab world between 1958 and 1981. I can’t imagine it’s a positive picture… what in particular did you look at? The kinds of questions I was thinking about was what do they get right and wrong, what were the so-called successes and failures – but also how did they conceptualise the region? How did they understand the Arab ‘other’? And also what did they think about perhaps two of the most important leaders of the Arab world and certainly of Egypt? These leaders were President Gamal Abdel Nasser, a nationalist who challenged British colonial presence in Egypt in unprecedented ways; and President Anwar al-Sadat who really initiated the shift towards the West that brings Egypt to its current position as one of the most important allies of the Western World. You’ve looked extensively at intelligence analysis in the Middle East. What has surprised you most about how the West interprets Middle Eastern politics? I was surprised at how good the intelligence assessments that I read or came across were! It wasn’t a great surprise to me that culture was really important in how they regarded the Arab world, and that stereotypes of Arab culture were significant in Western intelligence assessments. But actually the role that these cultural ideas played in analysis – sometimes positive and sometimes negative – were often nuanced and actually used by Middle Eastern actors, by Presidents, analysts, and advisers within the region, to forge their own agendas and shift Anglo-American analysis in the direction they chose. So in other words cultural ideas were not just used by the West to understand the Arab world but the Arab world used the ideas that the West had about them to serve their own strategic agendas and goals. So he saw this step that was really quite dramatic in breaking with the Arab fold as the only way to cut through what he called the ‘bluster and rhetoric’ of Arab politics. I mean, that is a stark example of what Edward Said [a Palestinian-American academic and political activist] might call native orientalism – the use of cultural stereotypes, negative cultural stereotypes about the Arab world, by Arabs themselves. One of your more recent projects has focused on the role that social media played in the Egyptian uprising as part of the Arab Spring in 2010 and 2011. How influential do you think social media was? It was really important in providing a space, a transnational space in which ideas about politics were debated and articulated in ways that hadn’t previously been possible or at least had been much more constrained. But I think in terms of actual mobilisation – getting people out onto the streets and creating the scale and the momentum for change – it’s more useful to think of social media as a tool that amplifies existing dynamics rather than a causal factor. There has been some debate among scholars about precisely what role social media plays, but for me I think that’s the most convincing argument that I’ve encountered. And what do you think the legacy of that has been? Social media provided this, to some extent unpoliced space in which citizens could debate, contest, challenge political authority in ways that they hadn’t been able to do previously or had been subject to much more stringent restriction and repression. The difficulty now is that states, authorities, regimes have caught up and now it’s much easier to police the internet than it was in 2011. So for example the Egyptian state has shut down more than 500 websites. You are much more susceptible now to be imprisoned, to be prosecuted for something you’ve said on social media than you were back in 2010 or 2011 so as a space it’s still important but it’s also much more restricted than it once was. However, it’s still the space of choice for activists and dissidents in Egypt. Here in the UK we don’t hear much about the political situation in Egypt so much these days. What has been happening there recently and what are the areas of Middle Eastern politics that you think are being under-reported? What tends to be reported in the Middle East are dramatic acts of violence and brutality, tanks, tear gas, terror; all of those images are really prevalent not just on western television screens but particularly so with western broadcasters reporting on the Middle East. Part of what I wanted to do with my project was to shed light on the deeper transformations that take place behind the scenes. For example, I’ve explored the emergence of Egypt’s first mainstream political satirist who went on the streets in early 2011 as a heart surgeon tending to protesters and would return home frustrated at what he was seeing on mainstream Egyptian television. So he decided to tell his own story about what was really happening on the streets. He called his show B Plus, after his blood type, and modelled the short satirical sketches on Jon Stewart’s ‘The Daily Show’. Within a couple of months his show had five million views before he was quickly snapped up by TV moguls. He’s become one of the most important figures and platforms in which Egyptian politics is discussed and debated – and this is happening in people’s living rooms. That’s what I’m really interested in – how politics is affecting real people, everyday people, and trying to bring something of that story to the West to complicate the violent images that we’re frequently faced with when talking about politics and political transitions in the Arab world. 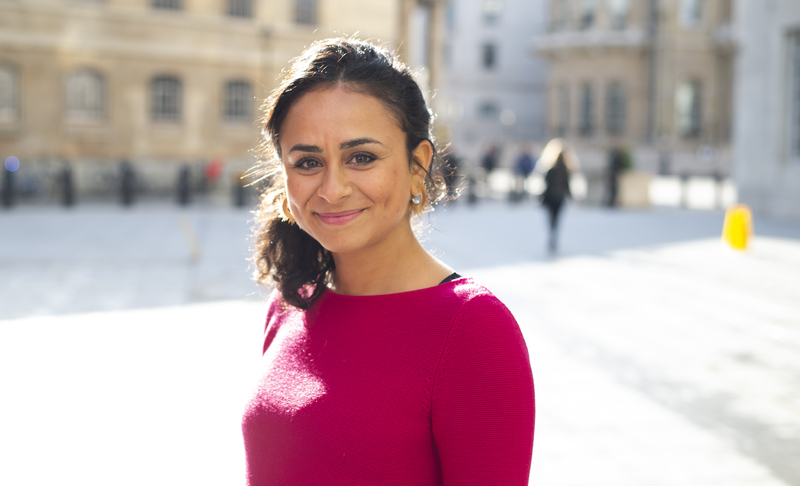 You’ve recently been named one of the AHRC and BBC’s New Generation Thinkers for 2019. What does it mean to you that you’ve been selected? It was a great surprise to be selected – the competition in the workshops I attended was fierce. For me it’s a signal of not so much the value of the research I’m doing but the significance that it can hold for wider audiences. One of the most impressive things about the New Generation Thinkers scheme is the breadth of history that it covers – the expanse of the human experience across time and space, geographic areas, millennia really. That helps us to consider what it means to be human and the challenges that we face in contemporary politics, but also to make sense of the world that we live in more broadly at the social level. Now that you’ve been given this platform, what do you hope to achieve? I see it as an opportunity not just to communicate specific things about my research and the significance of the work that I’m doing (on Egyptian politics and popular culture since 2011) – why it’s important to look at politics through the lens of popular culture but also it’s a wider opportunity to champion the humanities more broadly. What we do in the humanities is not necessarily come up with grandiose answers but ask the right questions. The value of a scheme like this is that it encourages you to apply yourself to a wider set of questions than those which you might naturally ask within your specialist area of expertise. Dina Rezk is Lecturer in Middle Eastern History at the University of Reading. Her research findings have led her to provide policy briefings to the UK Cabinet Office, Home Office, Ministry of Defence, Nato, and the US Department of Defense. She leads the research project ‘Social listening in the past, present and future‘. Dina was recently selected from hundreds of applications as one of AHRC and BBC Radio 3’s New Generation Thinkers 2019. She and the other nine selected academics will be publicly unveiled on Saturday, 30 March at a free event recorded as part of the BBC3 Free Thinking Festival at the Sage in Gateshead. Dina and the other winners will spend a year being mentored by producers from Radio 3’s Free Thinking programme, taking part in Free Thinking discussions and will go on to write episodes of BBC Radio 3’s The Essay.